My kids play hard and work hard. As they get bigger and enter the teen years, I find this even more true. But between the way they love to push their bodies and growing pains, I hear more and more about how their bodies and muscles are aching. So this week we created an easy DIY bath bomb recipe to ease those pains with a nice soak in a warm bath so they can relax or jump back into their play again! 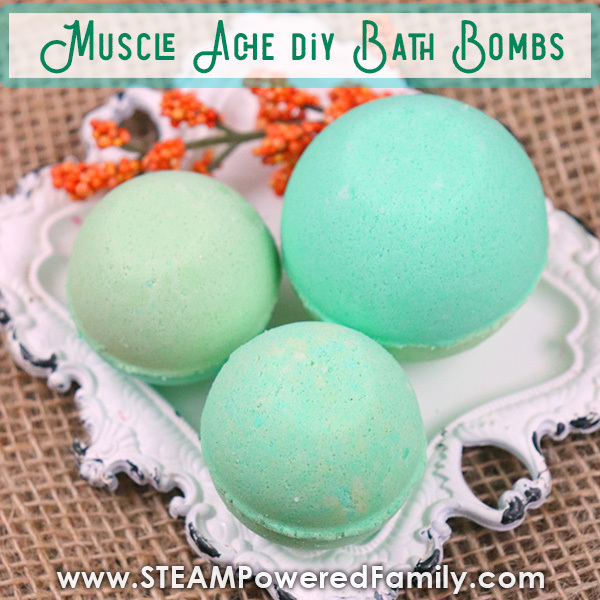 Making bath bombs is a fantastic activity to do with tweens and teens. Not only is it some fascinating science, but it is creating something tangible and useful. Too often kids are stuck learning from books, or creating things that really have no purpose. 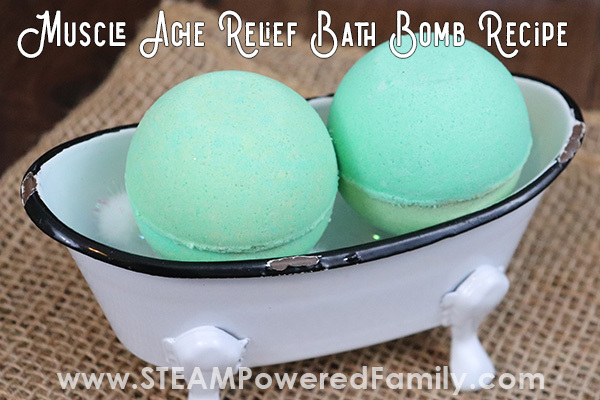 With bath bombs you can create something they can not only use themselves but gift to someone else who would love to use them. Really, who doesn’t love a warm, relaxing bubbly, fizzy, fragrant bath? It’s the ultimate in relaxation and self care. The first thing kids always ask about bath bombs is about why they fizz. Bath bombs fizz due to an acid-base reaction. In this recipe we have baking soda as our base and citric acid as the acid. When they are dry they don’t react, but add water and the chemical reaction is triggered, releasing CO2 gas that create the bubbles and fizz. What Are Epsom Salts and How to they help pain? In this recipe, our goal was to ease pain, so we added Epsom Salts. Epsom salts are actually magnesium sulfate and have been used for hundreds of years to help ease pain when combine with a warm soak. Epsom salts got their name from where they were they were originally found in England in natural springs, and they are called salts because of their chemical structure. Even though Epsom salts have been used for centuries to ease pain, and even today trainers and doctors around the world recommend using them in a bath to ease pain after a good workout, there has been almost no formal research into how it helps or if it even helps. Some people believe simply soaking in the warm water is enough. Perhaps this is a topic someone could tackle in a Science Fair project? Struggling with headaches? 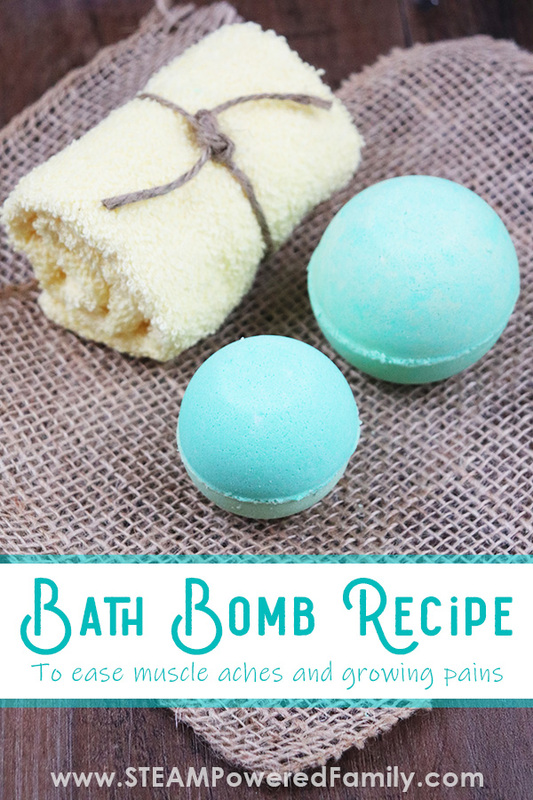 Check out our headache relieving bath bomb recipe. There is another fascinating ingredient in our bath bombs and one you never want to forget. It’s called Polysorbate 80 and it is an emulsifier. Ask any child if you can mix oil and water and they will proudly tell you NO! But with an emulsifier you can. Our bath bomb recipe uses oils and if we don’t use polysorbate 80 those oils will float on the top of the water, stick to the tub and your skin. It makes for a very messy bath and clean up is a beast that will take you more time than your bath, undoing all the relaxation created by the bath. 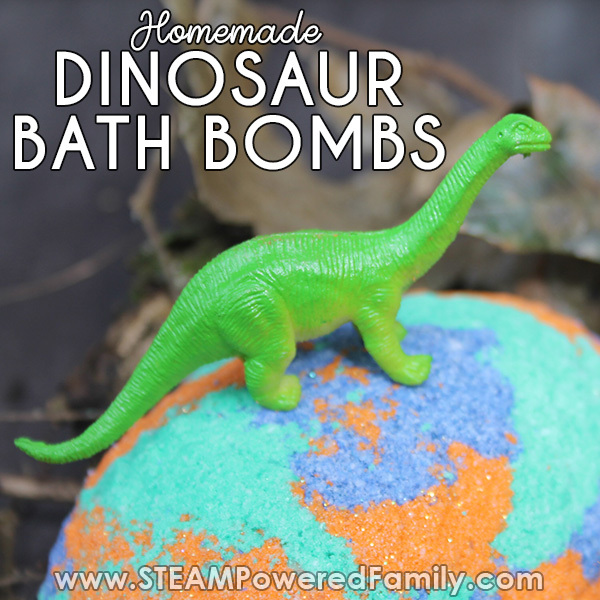 So don’t forget your emulsifier in your bath bombs! Regardless of the recipe the process for making bath bombs is always the same. Mix your dry ingredients, mix your wet ingredients, then mix them together. Colour your mix and pack your molds. Let set. 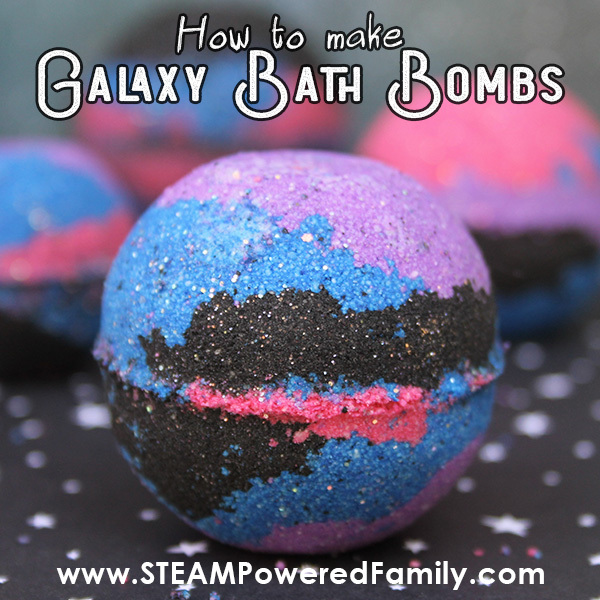 Here is a detailed, step by step process for making bath bombs. In a large mixing bowl, add the baking soda, citric acid, cornstarch, Epsom salts and SLSA. Mix all the dry ingredients together. In a microwave safe bowl, melt the coconut oil and cocoa butter.. Add the polysorbate 80 and the essential oils. Mix. Add the wet ingredients to the large bowl with the dry ingredients and start mixing everything together. Use your hands (with disposable gloves if desired). Break down any lumps and make sure everything is really mixed together. This takes some time. The mixture is perfect when it holds together when you press it into your hands and feels like wet sand. Separate mixture into two bowls and add 1 tablespoon of the darker green mica into one and 1 tablespoon of the lighter green mica into the other. Mix the colours in until evenly dispersed. If the colour is too light, add a bit more mica, but just be careful, a little goes a long way! Once you have the desired colours, take one mold and fill each side with the mixture until it is a loosely heaped and over-flowing. Press both sides together, using a twisting/grinding motion to get rid of any excess mixture. Then tap each side of the mold and carefully open it to release the bath bomb. I have a video of the process here on my Instagram. Leave the bath bombs to harden for 24 to 48 hours. Make sure you are keeping them in a low humidity area. Humidity in the air will cause them to start erupting. 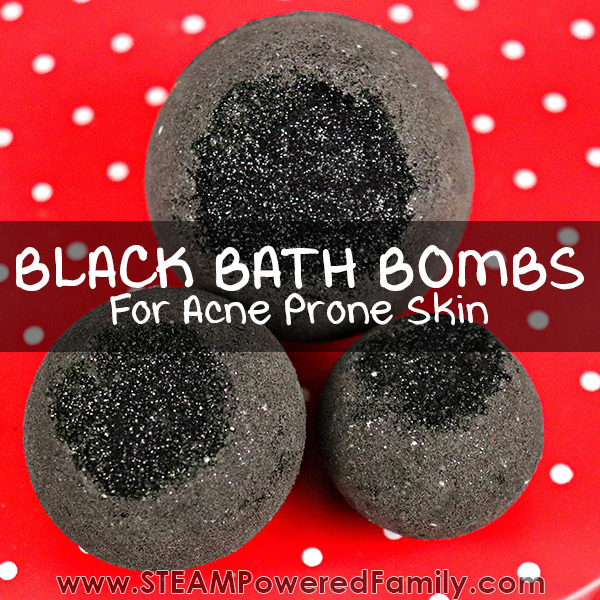 Once they are hard you can place them in an airtight container or wrapping until you are ready to plop them in your bath and enjoy a relaxing, pain relieving, soak.